On June 4, two important libraries in the Life & Health Sciences Division will come together under one roof as the Marian Koshland Bioscience, Natural Resources & Public Health Library. The Sheldon Margen Public Health Library — located in 1 University Hall, at Oxford Street and University Avenue — will close June 1. For more details, read the story at Library News. Not long ago, the coolest perks for UC Berkeley students were probably free bus rides and gym memberships. 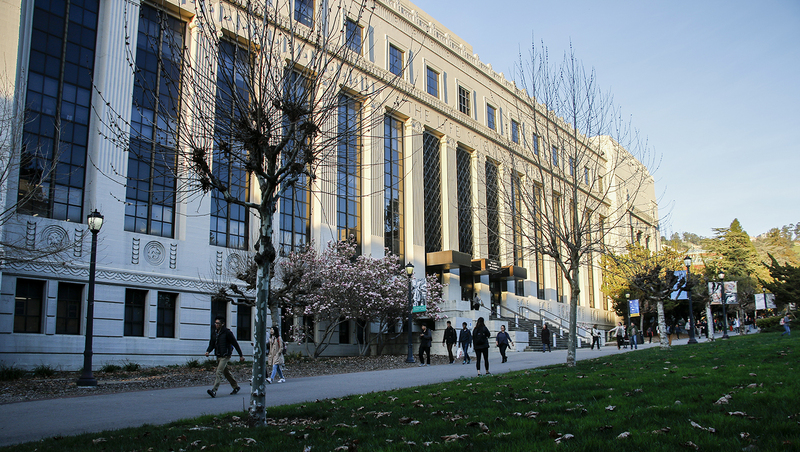 But now, students also have free access to a world of classes outside of the UC Berkeley campus through the online learning platform Lynda.com. As of last month, all students have premium memberships to the website, which hosts nearly 6,500 courses on topics ranging from web design and programming to media production and creative skills. The campus-wide Lynda.com availability began as a joint effort by campus and Library staff members who, a few years ago, recognized the lack of resources available to students responsible for navigating and ultimately leading in an increasingly digital world. One early champion of Lynda.com was Chris O’Dea, the production manager at the campus’s Graduate School of Journalism who heads technical instruction. 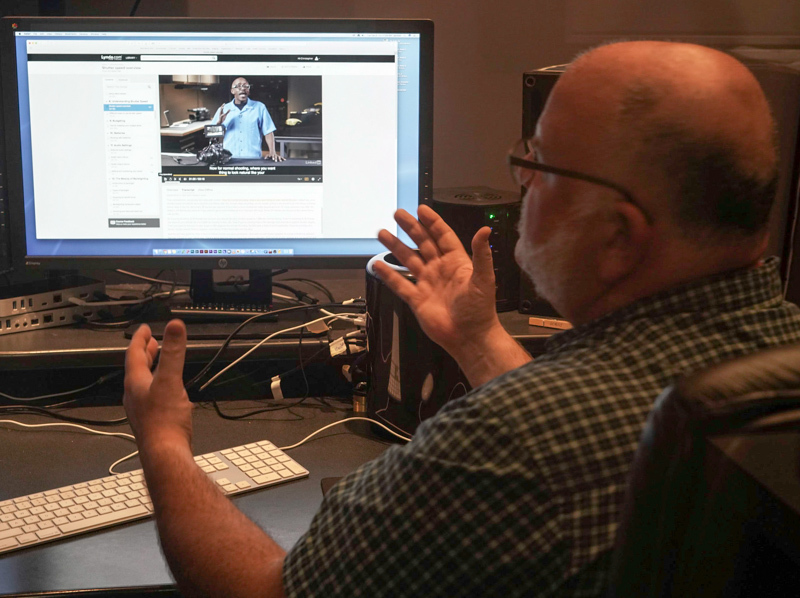 The J-School, O’Dea said, has cages full of technical equipment that students must quickly master, on top of the suite of editing software needed for multimedia journalism. Lynda.com offers full tutorials for the Adobe suite, used extensively at the J-School. The site also has introductory classes on computer coding, which are invaluable for journalism students learning data visualization, O’Dea said. “We are the smallest professional school on campus, but we have some of the biggest technical needs,” said O’Dea, who has used Lynda.com for the past 10 years. The learning curve can be overwhelming for students, O’Dea said, and tools such as Lynda.com can be important buffers for the rocky road. Previously, the J-School had purchased individual subscriptions. On the site, which is owned by LinkedIn, courses are taught by experts in the field — including Berkeley faculty members — and come with downloadable exercise files for users to work alongside the instructor. There is also a transcript of each lesson below the video, and corresponding text is highlighted as the instructor speaks. O’Dea was part of the team who helped get Berkeley students free access to Lynda.com. That interface is key for the Berkeley campus, which has a large international student body, O’Dea said. “(Having the words) is pivotal when you’re trying to learn something,” he said. In the search menu, courses can be filtered by skill level, duration, instructor, and subject. And because the lessons are fully transcribed, users can scan entire courses for particular words and skip to the sections they need. Three years ago, O’Dea approached campus administrators about getting Lynda.com for students. O’Dea was so passionate, in fact, that the campus thought he was trying to sell them something. 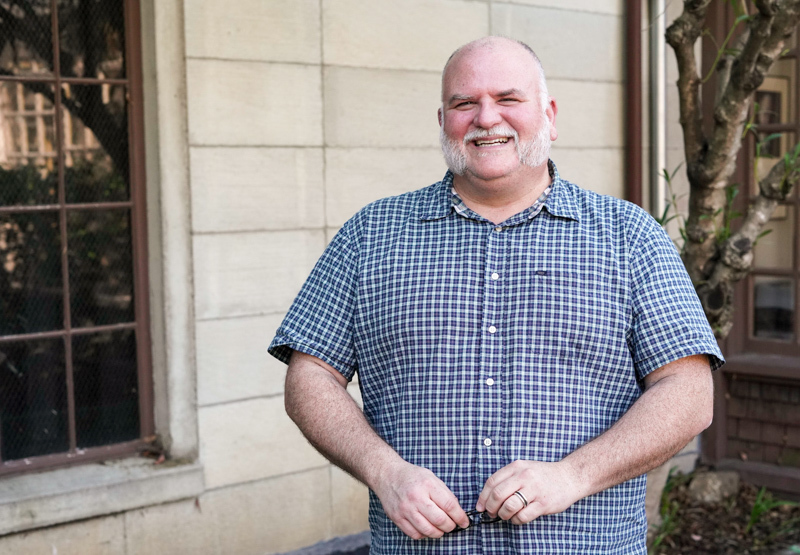 The campus gave O’Dea a job: to rally support from other departments and gauge how the platform could benefit other schools and centers on campus. O’Dea started with the Library — which, incidentally, had similar efforts underway. According to Cody Hennesy, the campus’s e-learning and information studies librarian, the Library had conducted a survey of students to learn what their technological needs were and which of them were not being met by the campus. Using that information, along with discussions with O’Dea and others, Hennesy wrote a proposal for Lynda.com student subscriptions and offered it to the Student Technology Fund, which makes recommendations to the chancellor’s office on how to allocate funds for technology projects. Students can find recommended Lynda.com courses for UC Berkeley students on the website for the Library’s Level Up initiative, which aims to strengthen student’s digital literacy and technical skills. The voting members on the Student Technology Fund Committee (STFC) are mostly students. The STFC recommended $63,750 for a two-year pilot program, said Aneesh Chimbili, a program associate at the Student Technology Fund who helped provide a student perspective to the committee. The STFC may decide to continue funding the subscriptions after two years if the Library can show data that enough students have used and benefited from the platform, said Aayush Patel, also a program associate at the Student Technology Fund. For Chimbili and Patel, who are both students, the great benefit of Lynda.com is that it widens the range of disciplines that students have access to in a traditional course load. Aside from software and technical skills, the site also has classes on business strategy, marketing, and leadership. Of course, Lynda.com does not supercede professorship, O’Dea said; nothing can replace the sense of inspiration and guidance born in a real classroom. But it can certainly complement the academic experience, and the challenge now will be for campus instructors to figure out how to integrate the learning platform into their classes. For now, the J-School wants to use Lynda.com as kind of homework, where professors might assign a 15-minute video on editing software to a student and have them come in the next day to work on a shared piece. “This — properly harnessed — can only add benefit in a classroom,” he said. At a special viewing of rare musical materials, the message to the audience was clear: We could not have done this without you. Gathered around an impressive display in the Jean Gray Hargrove Music Library was the Library Legacy Circle of The Benjamin Ide Wheeler Society, a group of donors who have remembered the Library in their bequest plans. 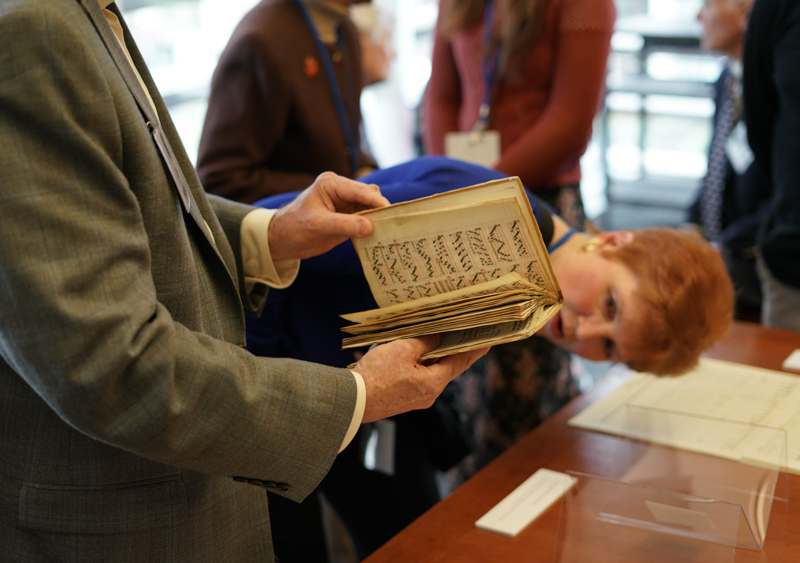 This was the first such event for the Legacy Circle, and the Library plans to continue the tradition annually — unearthing gems from each of the campus’s 25 libraries. 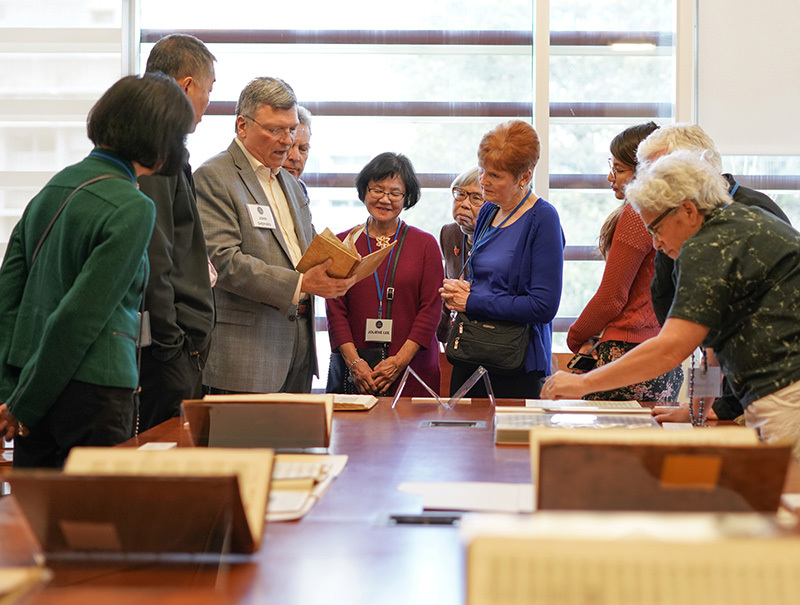 After a tour of the Music Library, John Shepard, curator of music collections, showed the group treasures he had selected from the collection and described their unique story. Among the gems were an original manuscript of Ludwig van Beethoven’s String Quartet No. 6, scribbled in his own hand; a theory book on Gregorian chant music from 1375; Jacopo Peri’s La Dafne d’Ottavio Rinuccini, recognized as the world’s first opera; and first editions of George Frideric Handel’s coronation odes, which have been performed at every English coronation ceremony since that of King George III. The Library has several first editions of Handel pieces, which regularly attract musicologists and Handel experts to the campus, Shepard said. The Music Library has eight substantial endowments, which allow Shepard to chase and collect unique materials. Donors view one of the Music Library’s rare collections at the luncheon. Before the viewing, University Librarian Jeffrey MacKie-Mason thanked donors for their support and described recent developments and efforts underway at the Library — including the Level Up initiative on digital literacy, and the Digital Lifecycle Program, which makes rare collections more accessible to scholars worldwide. “We’d like to make all of those (resources) available online right now, so that all of you, and every K-12 student in California, and on the planet, can access our special, rare historical collections anytime, anywhere,” MacKie-Mason told the group. The Library has 60 million items not yet online, he said. Meanwhile, state funding per student continues to decline, and it is increasingly difficult for campus departments to stay afloat. Only 14 percent of the campus budget comes from the state; the remainder is pulled from tuition and donors. 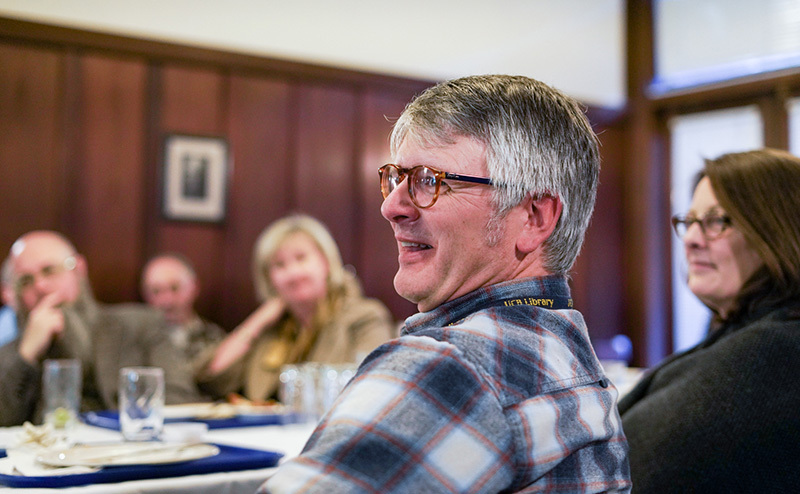 Jeffrey MacKie-Mason, University Librarian, center, welcomes donors to the Library Legacy Circle luncheon at the Music Library on Feb. 10, 2018. Wong’s parents met when they were students at Cal. During her father’s junior year, he received a scholarship that let him stay in college — and gave a shy kid a reason to ask Sheryl’s mother out on a date. “My mom was very popular,” Wong said, laughing. “My dad knew her, but he was a nerd, an engineering student — he would never have asked her for a date. After her father died, Wong helped her mother endow a scholarship in her parents’ name. Closing his remarks, MacKie-Mason gave one last thank you on behalf of the Library for the Legacy Circle’s perennial support. “It’s because of people like you that we have a bright future,” he said. 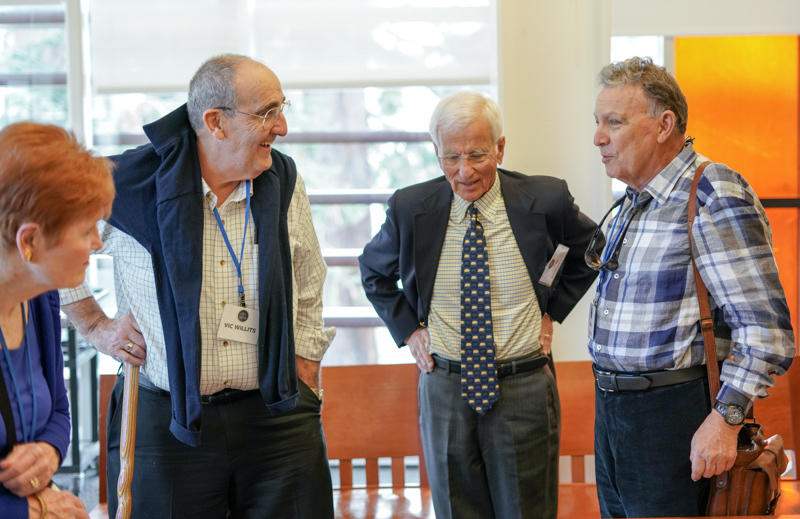 Left to right: Dr.​ ​Victor W. Willits ’62, Ed.D. ’68, Col.​ ​Don E. Kosovac ’58, ​and ​Mark W. Jordan J.D. ’66 chat at the event. Left to right, acquisitions assistant Rachel Lee, map metadata and curatorial specialist Heiko Mühr, and curator José Adrián Barragán-Álvarez were among those in attendance. Randal Brandt, head of cataloging, participates in the event. In 1922, Firgie Todd wanted to make a shirt for her boyfriend, Charlie Smith. Todd had forgotten to take Smith’s measurements the last time she’d seen him, however, and the two lived far apart, on opposite ends of Humboldt County, California. But Todd, a clever woman, had a plan. The charming correspondence can be found in a box of material on the family of James Samuel Todd — a Presbyterian minister who moved to California in 1868. Firgie Todd was James Todd’s granddaughter, and hers is one of many love letters living in The Bancroft Library. The letters, which go back to at least 1851, when the California Gold Rush tore many a lover apart, document the quirks and pains of love through war, separation, and cultural strife. In a pre-digital, largely pre-automobile world, the letters show the resolve and resourcefulness of long-distance relationships, kept alive through streams of affection and babble. In many cases, letters traveled between lovers as if on a merry-go-round, coming and going precisely each week. And so, for the lover in you this Valentine’s Day, here’s some inspiration from lovers past, pulled from the troves of the Bancroft collection. 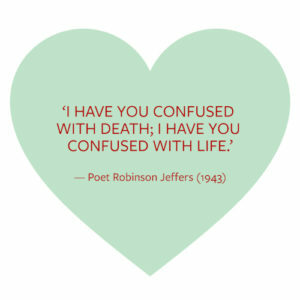 The quotes are grouped by common themes that reflect the sentiments of nearly 120 letters between seven pairs of lovers. “When I cast my eyes over the much-valued lines of your letters, I can almost imagine that Carrie is near me. I can hear her sweet and gentle voice. It leads me to ask myself how long will it be before I shall have the pleasure of seeing you. O, may the time be as fleeting as the tears of an infant.” — James J. Bxxxx, who signed his name like that, writing from Drayton, Georgia, on March 21, 1856 to a woman named Carrie. “I am waiting for the day when you will be telling me that there is too much pepper and not enough salt.” — Eva Weintrobe to Morris Davis on March 3, 1938. Weintrobe worked as a seamstress in Liverpool. The couple wrote back and forth for a year — breaking up once or twice over some hastily written letters — until Weintrobe left her family in England to marry Davis, an American in New York. “I, who kept on telling you to think of the future whenever the loneliness of the present would sadden you, I feel depressed and disheartened a la folie. … Don’t scold me for it Lily — It is only a passing weakness, and will be short-lived. … [T]here is a balm for my ailment, and that is the very first of your cheering smiles,” wrote Nathan Edelman to future wife Lily Pokvidz on Sept. 7, 1931. Pokvidz, an author and educator, was born in San Francisco and lived in Petaluma during the couple’s courtship. 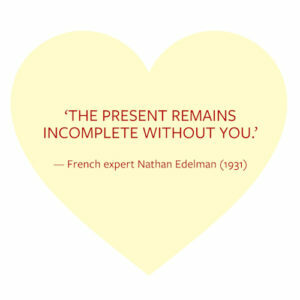 Edelman was studying languages at the time and became an expert in French literature. They often worried that Edelman would be drafted to fight in World War II. “I’ll never be whole till you return to me, I must have you at my side, with me, around me, in me … the present remains incomplete without you; music, which I adore, sounds flat … yes! even Gilbert and Sullivan! — sound frivolous.” — Nathan Edelman to Lily Pokvidz on Sept. 7, 1931. “Darling, there is no one like you in all the world — every gesture beautiful, and every inflection of your voice and movement of your mind. I think of you every instant — really — day and night — don’t you feel it? It is very hard not to be able to see you, and hear you, and touch you. … The night is wild/With stars but ours/Has not risen yet/Some might it will/— sometime soon —/I hope I don’t go/Mad first.” — Robinson Jeffers to Connie Flavin Palms, 1943 (date unknown). “What made you think I was sore with you about something? If it was because I did not answer sooner, I want you to know that I am not a person of leisure and have not much time for letter writing. … You asked me again why I do not write more sentimental and intimate letters. I am not a poet and cannot express my feelings in black and white and feel I will not be doing justice to my feelings.” — Eva Weintrobe to Morris Davis, April 10, 1936. “When you will write, I shall feel once more in contact with you — but you must write me all your thoughts and share all your emotions with me; you must let your pen run as if your mind; free and open, were expressing itself without any restraint whatever; I wish to feel you through your letters, and by adoring the Lily I shall divine between the lines, I will find a year’s waiting more bearable.” — Nathan Edelman to Lily Pokvidz, Sept. 7, 1931. “I’ve read and read your precious letter — it’s the strangest thing how the older we get, the harder I find our separation, no matter of how short duration. To bear, I clutch at every scrap of letter to shorten the gaps and narrow the distances.” — Lily Edelman to Nathan Edelman, Jan. 1, 1943. “Dear Carrie, I anticipated an epistle from the last mail, but was sadly disappointed. You can not imagine my feelings when I called at the office. … No letter from Carrie, one that I love.” — James J. Bxxxx to Carrie, April 18, 1856. “You don’t know how I long to see you to hold you in my arms and call you my own but I don’t know when that will be again. Money is what I want for I know I have got to have that before I can claim you. … I shall not come until I can offer you a home, and I presume you will be married before that time comes for it will be years before I can do that, and you will get tired of waiting.” — A man named Ralph, writing from Corning, California, to Myrtie on March 9, 1880. “Never can I forget the ecstatic thrill of thy sweet kiss or the rapture of folding thy lovely form to my bosom.” — Gold miner Alfred to his fiancee, Orpha, on Aug. 7, 1851. “As much as I should like to travel the world over, like a master of the planet, I could forget that yearning, in your presence. With your hand in mine, and a deep, soulful kiss from you, and with you next to me everywhere, in everything, I would have the bliss of an eternity.” — Nathan Edelman to Lily (Pokvidz) Edelman, early to mid-1900s. How important is a word to a particular genre? Who initiates violence more often: protesters or police? What if we could search for things based on shape, rather than keywords? At a conference for the digital humanities hosted by UC Berkeley, computer scientists and humanists gathered from around the U.S. to discuss bold research questions like these, made possible by growing stores of data in digital libraries and a few new machine learning tricks. One such library is HathiTrust, a digital database of 16 million volumes. The organization, co-located at Indiana University and the University of Illinois, also has a research arm: the HathiTrust Research Center, or HTRC, which offers tools and guidance for researchers wanting to mine the collection for new discoveries in human language and history. In late January, the center held its 2018 HTRC UnCamp, filling the fifth floor of Moffitt Library with project presentations and crash courses on textual analysis. 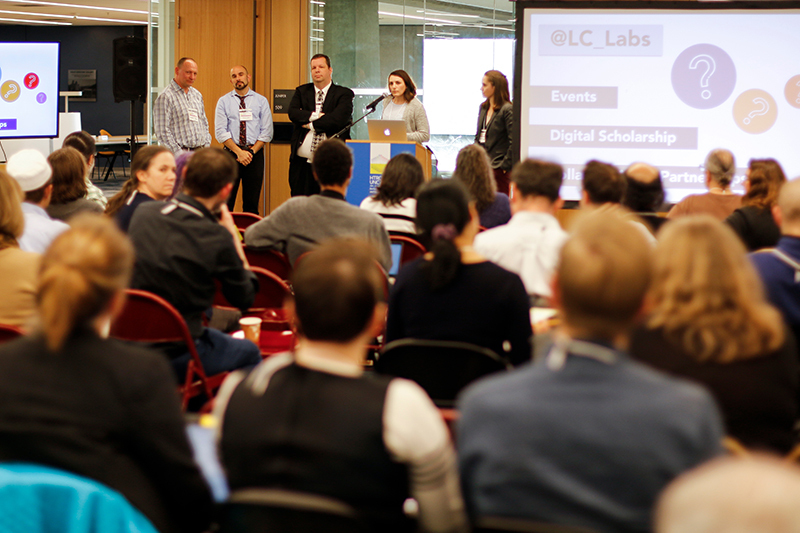 The conference also included break-out sessions throughout campus, in the D-Lab and the Berkeley Institute for Data Science, or BIDS. 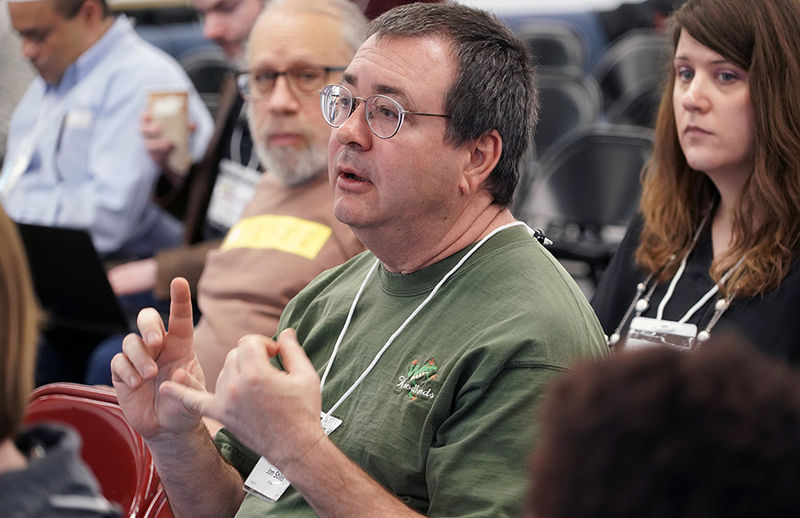 The goal of the UnCamp was to pull together the diverse group of researchers using HathiTrust, from educators and librarians to community members, explained Robert McDonald, associate dean for research & technology strategies at Indiana University. This conference in particular was exciting, McDonald said, because of a surge in community engagement and attendance as people have become more familiar with the database. About 150 people registered for this conference, he said, compared with about 30 at the last UnCamp, in 2015. On its website, HathiTrust boasts several built-in algorithms that help researchers learn new things about texts based on their metadata — features such as word usage and page numbers. Most of the digitized texts in the collection are still under copyright, so researchers are cut off from studying them in traditional ways. The benefit of HathiTrust’s database is that computers, not humans, are searching the texts, so researchers can still discover important linguistic clues without violating copyright. The web-based tools on the site radically expand what researchers can do with their work. But perhaps more significantly, those capabilities also widen circles in the humanities, by introducing the need for new skills and surprising collaboration. “The more of that, the better,” he said. University of Nebraska researchers Leen-Kiat Soh and Elizabeth Lorang, who gave one of the keynote talks at the conference, are a good example. Soh is a computer scientist, Lorang, a poetry-loving librarian. Together, they created AIDA — a tool to search digitized images for specific types of literary content. At the conference, they showed how they’re using machine learning to find poems buried in historic newspapers. Tens of millions of poems have been published in historic newspapers, but not all of them end up in the “poet’s corner.” They’re sprinkled throughout obituaries, marriage announcements, and advertisements. You’d have to comb through each newspaper by hand to find them — an impossible task. Instead, the team tried to think about what a poem looks like. They measured the spaces between stanzas and the jaggedness of the right margins, and trained an algorithm to detect similar patterns across endless fields of black and white. 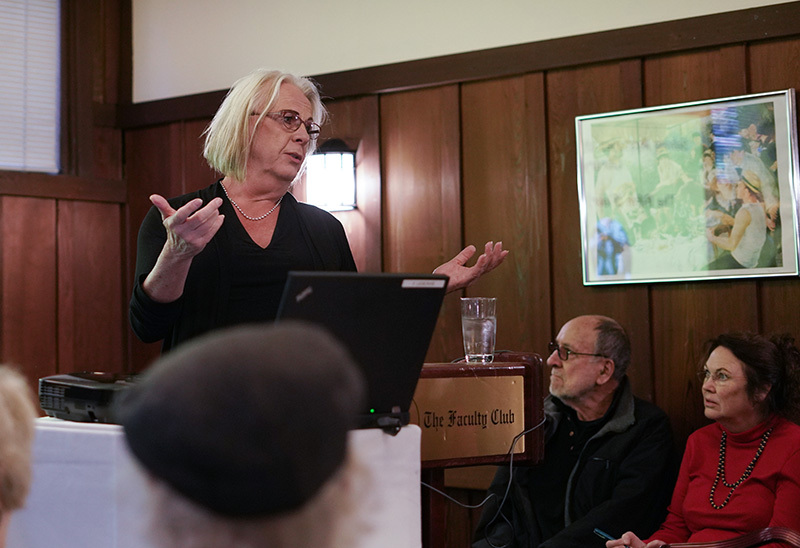 “We could pursue this as a research project for years and years, but ultimately if there’s not uptake in the community, it’s not going to matter,” she continued. The conference, she said, was a chance to get feedback on their project, as well as get a better feel for where to go in the future. The wider goal, she said, is to bring attention to lesser-known poems and correct some historical oversights. With our current search tools, we’re only ever looking for names and lines we already know about, she said. Many of the projects discussed focused on recovery work in our collective canon. Textual analysis and big data make lesser-known voices easier to find, giving us the chance to reshape the cultural record. One conference guest, Annie Swafford, a digital humanities specialist at Tufts University, is curating a corpus of works by a group of British women who, in the 1880s, formed the first women’s literary dinner club. “Women didn’t just want to talk about clothes — they wanted intense, philosophical discussion,” Swafford said. She’s interested in how the vocabulary and themes of women’s writing of the time differed from their male counterparts. Swafford came to the conference to discover new research tools for her work, but also to learn how to support others’ work. Swafford is Tuft University’s first digital humanities specialist, and next month, she’ll lead an introductory workshop on textual analysis. She said she’s excited to show people some of the HathiTrust tools. She particularly liked Bookworm, a simple program that compares the popularity of a word across place and time and can help teach students about how language is a changing phenomenon. Audience members played with Bookworm on their personal computers during the conference. They also tried their hand at creating work sets with the HathiTrust database, and running simple text analyses such as topic modeling (where a computer sorts through word patterns and clusters related words together to give you an idea of what a text’s major themes are). A major focus of the UnCamp was educating people about how to take advantage of HathiTrust’s digital collection. 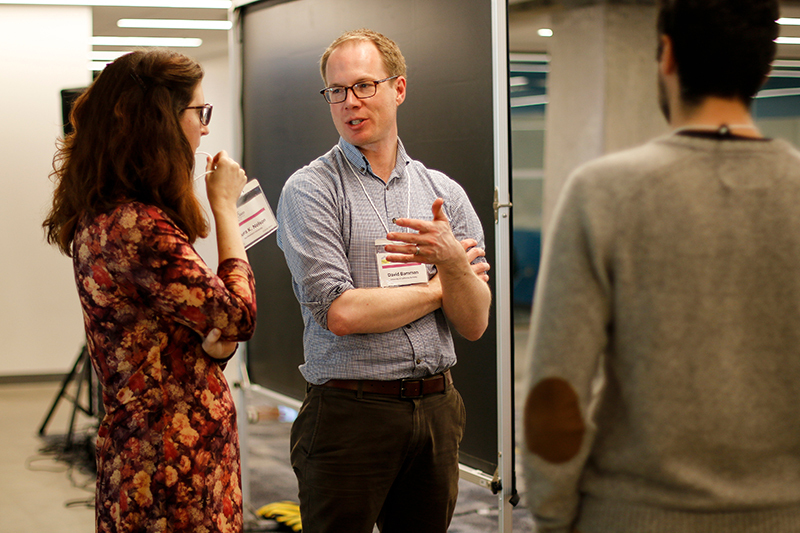 During the hands-on sessions, Chris Hench, a postdoc at the D-Lab and BIDS, presented an instructive module he built with Cody Hennesy, the campus’s information studies librarian, to teach people how to build worksets from the database. Teammate Alex Chan, a third-year computer science student, then showed attendees an example of the kinds of programs users can build to investigate those collections. He presented an algorithm he built that, after a bit of training, can automatically sort volumes into genres based on similarities in language. The educational HTRC module, Hench said, was an extension of some of the data analysis training that Berkeley’s Division of Data Sciences has been offering around campus. Hench and the data science modules team visit a range of courses, working with students to answer relevant questions with crunchable data. In an International & Areas Studies course, for example, students investigated different measurements of social inequality. The data team helped the class quantify the weight of societal factors such as education, wealth, and income, and plug them into an overall inequality assessment. With all of the exciting content, most speakers barely finished their presentations in time, hurrying through their last slides, anxious to share final details. 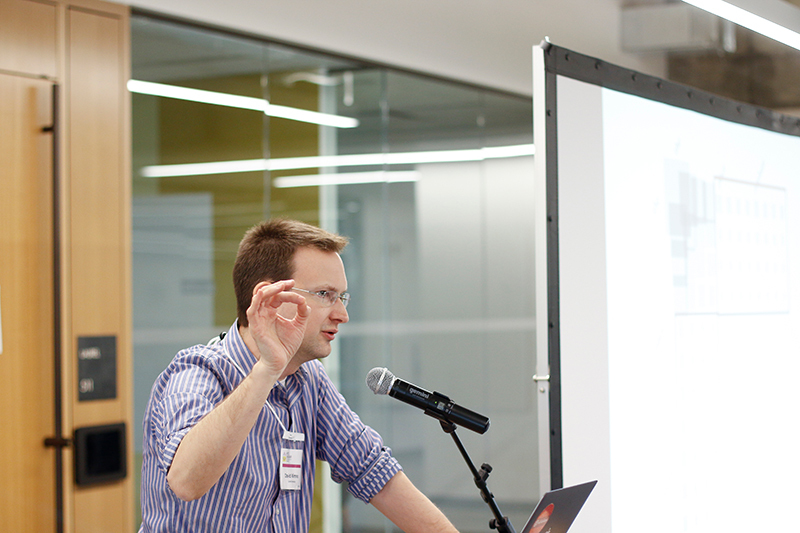 Nick Adams, who works in BIDS, presented the web interface he developed to crowdsource the arduous hand-labeling work needed to train algorithms. Right now, he’s examining newspapers in 184 cities for stories on protests to analyze why and how police and protesters initiate violence. In the last seconds of his talk, he turned to acknowledge his collaborator, Norman Gilmore. Ever wondered who to blame for Berkeley’s infuriating roadblocks? One answer lies in the troves of UC Berkeley’s Earth Sciences and Map Library, in a traffic management plan from 1976. The map shows intersections throughout Berkeley covered in little orange ticks — signs for where a new generation of traffic diverters would arise. 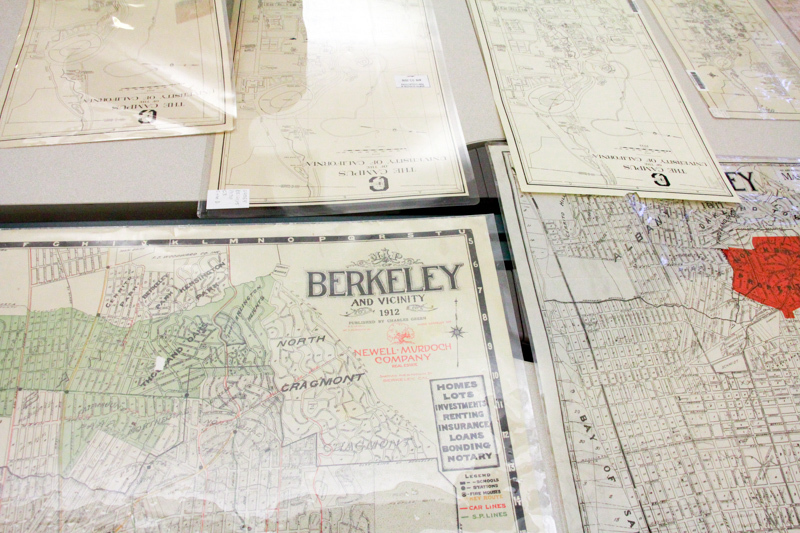 The traffic map is on display as part of a pop-up event on Friday called Mapping the University — featuring a collection of maps that, together, tell the story of how the university and city of Berkeley have developed over the years. 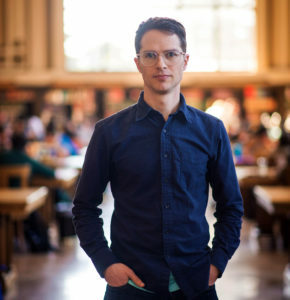 “I added (the traffic one) because I find these roadblocks in Berkeley very distressing, and confusing,” said Sam Teplitzky, Earth and physical sciences librarian, smiling. Maps of Berkeley and campus are displayed at the event. 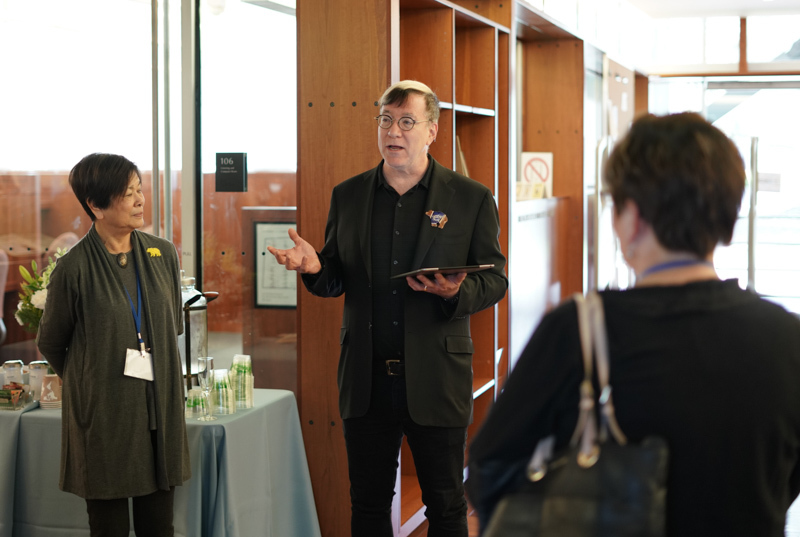 Teplitzky, along with Susan Powell, geographic information systems and map librarian, put together the exhibit in celebration of UC Berkeley’s 150th anniversary. The pair dived into the Library’s collection, choosing works that could tell Berkeley’s history in the most compelling way. The exhibit is organized chronologically and combines an eclectic group of maps, from tourist maps advertising local businesses to sweeping drawings of Strawberry Valley. 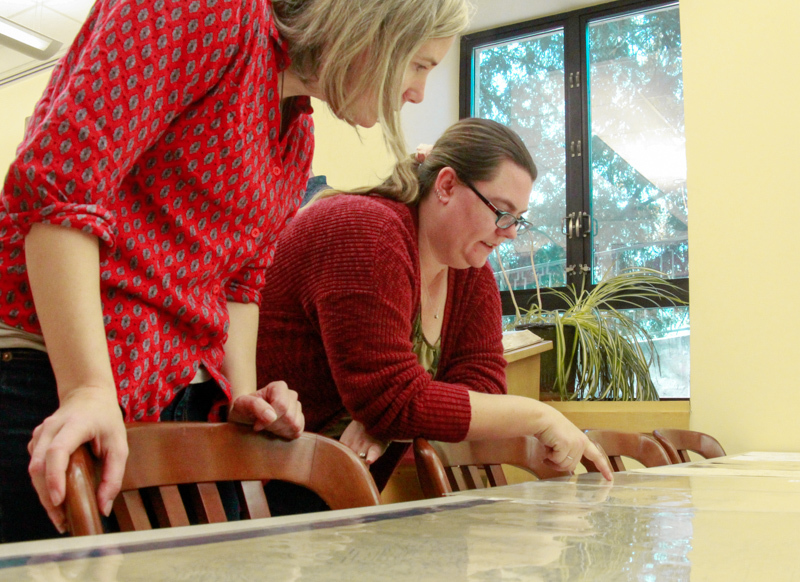 Susan Powell, left, and Jennifer Osgood discuss a map at the event. One specific gem is a map from 1932, before the campus expanded onto Telegraph Avenue to build Sproul Plaza and its surrounding buildings. (Hazel H. King owned some property next to Dwinelle Hall; Myrtle M. Rowell probably lived where the university’s police department now stands.) Another cool piece is a black-and-white aerial photograph showing land being excavated for the underground Main Stacks during its construction in the 1990s. At the exhibit, visitors huddled over the collection, twisting and turning the maps in an attempt to orient themselves. Many tried to locate familiar spots, superimposing the century-old depictions with the vivid maps in their heads. Andy Johnson, who lives in Berkeley, is a self-proclaimed “map nerd” who collects maps for fun. He said that looking at a map is like “taking a trip,” and compared the collection to a slow-motion animation. Johnson particularly enjoyed the maps showing bird’s-eye views of the city, which showed the university and local neighborhoods, but also the ocean, flowing at Berkeley’s edge. He pointed to the ships at sea, drawn with hovering plumes of smoke, and noted how maps capture not only buildings, but activity and life. For Johnson, they can also immortalize our hopes and ambitions. 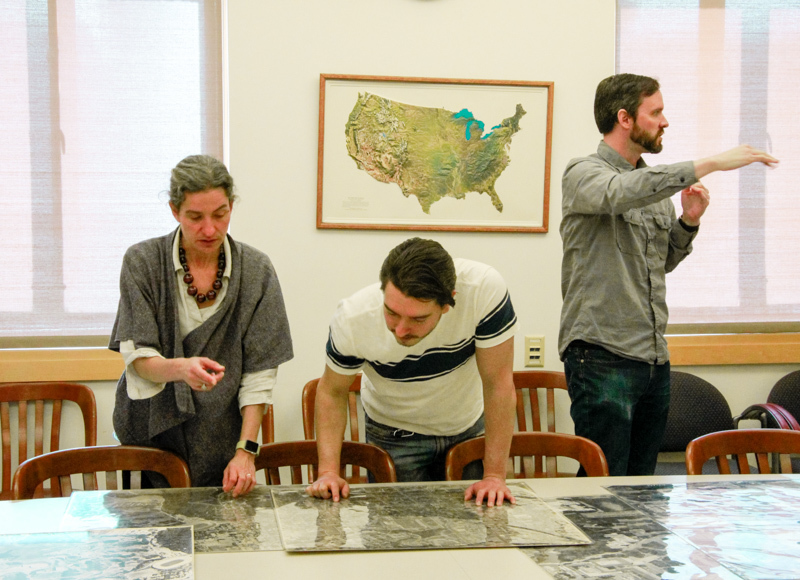 They pop-up exhibit was part of the Library’s larger Maps and More series, which aims to highlight the breadth of the collection and inspire potential research projects among students, Teplitzky said. Next month, they’ll have a walking tour of the Hayward Fault, as well as an exhibit mapping the history of indigenous peoples in California. My love for you is a monolith of try. So reads the first stanza of TC Tolbert’s poem “What Space Faith Can Occupy,” which filled the air of Morrison Library on Thursday afternoon during the Library’s Lunch Poems program. The stanza comes from Gephyromania, a collection of poetry from Tolbert, who is the poet laureate of Tucson, Arizona. “Gephyromania” refers, literally, to an obsession with bridges — and it’s an idea that’s come to define much of Tolbert’s work. Tolbert is transgender and writes often about the transition and experience of the body. Tolbert uses poetry as a bridge into and through his experiences, both painful and joyous. As a preface to his reading, Tolbert shared personal details about his childhood with the audience. Tolbert is a survivor of childhood sexual and physical abuse, and was derided by his mother after coming out. Who hasn’t killed herself by growing into someone? What I wanted was for everything to stop, but not end. Barros said that the concept of being in between identities touched him and resonated. Many of Tolbert’s poems feel deeply personal and empathetic. 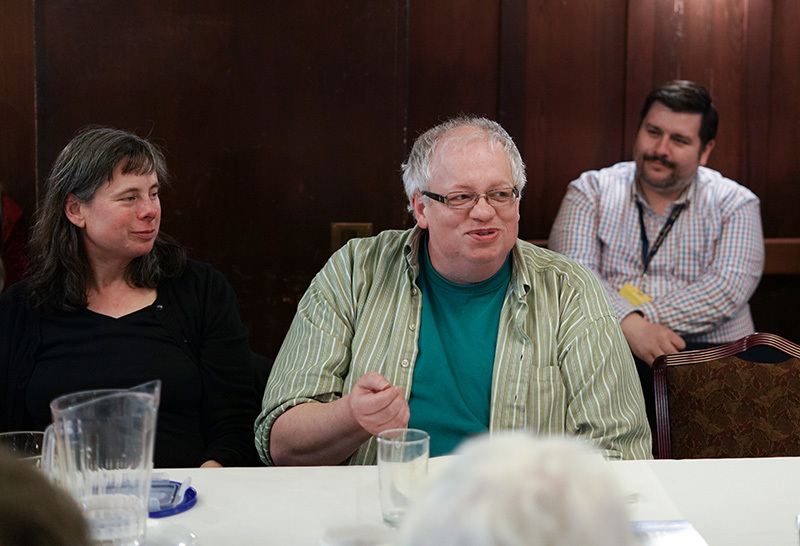 Geoffrey O’Brien, the director of the Lunch Poems series, praised Tolbert for his ability to write poetry that not only examines his own identity, but incorporates the experiences and lives of others, as well. In 2017, Tolbert was named poet laureate by Tucson’s mayor. In his community, Tolbert uses poetry to connect with others and uplift the voices those often silenced, particularly those of LGBTQ youths, immigrants, refugees, and youths of color. 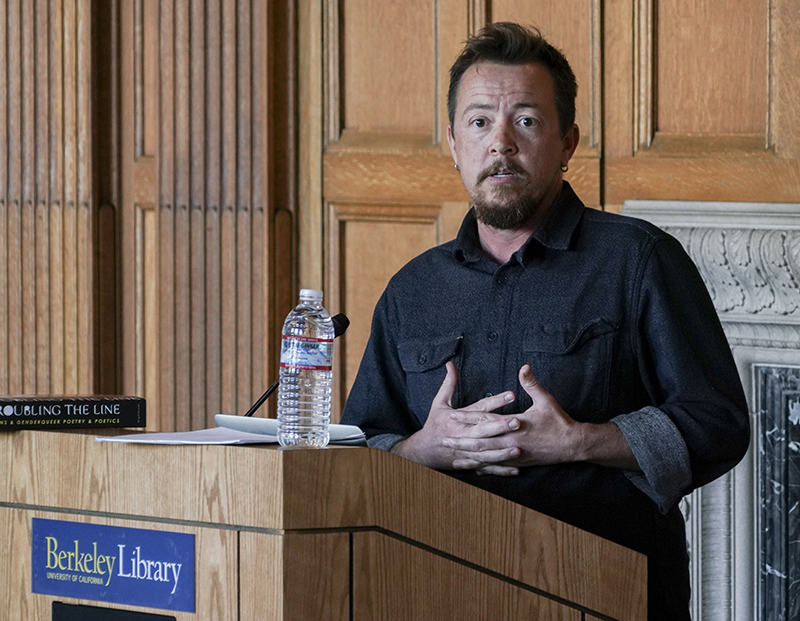 “I’ve never seen a poet who’s more sensitive to a room, to the people populating it, and to everything that’s happening outside of this room in history as the poetry reading transpires,” O’Brien said to the audience while introducing the poet. Lunch Poems is a noontime poetry reading on the first Thursday of the month. Admission to the Morrison Library event is free. Check out the spring semester schedule. Watch videos of past readings. Support for this series is provided by Dr. and Mrs. Tom Colby, the Library, The Morrison Library Fund, the Dean’s office of the College of Letters and Sciences, and the Townsend Center for the Humanities. These events are also partially supported by Poets & Writers Inc., through a grant it has received from The James Irvine Foundation.